"In the world of archeology, all news is old news!" More Changes at the T. R. M. P.--There have been many changes over the past several weeks at the TRMP website. Most obviously, our logo has changed to a depiction of Anubis mummifying a body. We've also added some "frills." Our entry page now features the Tale of the Cache Tombs which used to appear on our left hand menu bar. The logo which appears on the entry page is also animated with images of various mummies that fade in and out of view. We also have a background soundtrack! This haunting sound composition was designed for the www.shabtis.com website by Peter Willmott, and is used here with his kind permission. Thanks also go to Glenn Janes and Roger Dowling who provided technical assistance in transferring this sound track onto my web page. (Click here to see the revised site entrance if you entered our site via some other page) We hope you like the changes. The Pierre Loti pages also have background soundtracks which hopefully complement the eerie ambience conveyed by his remarkable accounts of mummies and royal tombs. There is a link at the bottom of the page devoted to Loti's visit to the Hall of the Mummies which you shouldn't miss. It leads to an animated image of Nesitanebetashru which shows this remarkable mummy in different intensities of light. This macabre image appears on a page with other photos of Nesitanebetashru and some of her grave goods. A More Serious Note--We've also added a statement to our left hand menu bar about our acknowledgement policies. Many web-designers have written to us since we opened in 2000, thanking us for the clear acknowledgements and links we give to their websites. Sadly, not all websites follow the same polite policy. 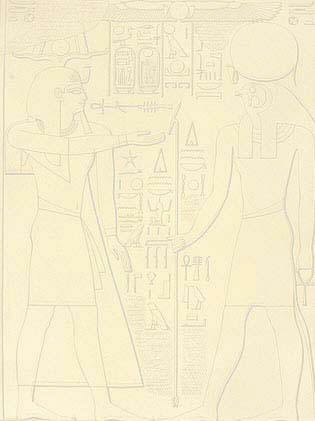 I recently discovered that a prominent Egyptological website had used many images from our Yuya and Tuya "Special Exhibit" without any credit being given to the TRMP. Worse, they had copied my entire commentary on Arthur Weigall from this same exhibit verbatim without acknowledging me as the author! Although I wrote to them about this on March 31'st, I have still gotten no reply as of the time of this writing. Consequently, alert visitors will note that a certain website no longer has a link on my links page. Other links to this website scattered throughout our pages will be replaced as soon as other sites providing equivalent historical/biographical data are found. Yuya and Tuyu Exhibit Update--Check out the additions to our Special Exhibit on the Tomb of Yuya and Tuyu. New images have been added, and the texts accompanying them have been expanded to include a lot more information. All the objects now have museum numbers for easy referencing, and the texts contain more data about the symbolic decoration which appears on them. Stylistic features are also placed within their historic/developmental contexts. We believe that our Yuya/Tuyu Special Exhibit is now much more comprehensive than before. And new data and objects will be added over the coming weeks. Theban Royal Mummy Project Updates---Major work has begun again at The Theban Royal Mummy Project. The entries for Sitamun, Prince Sipair, and Ahmose-Meryetamun in the 18'th Dynasty Gallery are now completed. So is the entry for Ramesses IX in the 20'th Dynasty Gallery. A second Unidentified Mummies Gallery has been added in order to provide a place for unidentified mummies not associated with either DB 320 or KV 35. The KV 20 mummy (Hatshepsut?) has been moved to this second gallery, and I also placed the KV 5 human remains and the KV 34 intrusive burials here as well. The first Unidentified Mummies Gallery is nearing completion, and the entries on Bakt and Unknown Man C (Nebseni) from DB 320 are completed, as are the entries on the Unidentified Boy and the Younger Woman from KV 35. To this gallery I have also added the KV 35 mummy traditionally referred to as "The Body on the Boat"--a mummy that C. N. Reeves thinks may be Sethnakhte. I will save Tutankhamen (and his two children, yet to be added) for last due to the large amount of material that needs to be reviewed for their entries. I've also added three "Special Sections" to the left-hand menu bar. Two of them showcase the atmospheric prose of turn-of-the-century French writer Pierre Loti, and derive from his 1909 book La mort de Philae. In one (entitled Spend a Night with the Royal Mummies on our menu bar), Loti describes his nocturnal visit to the Hall of Mummies in the Egyptian Museum of Antiquities. This account is quite memorable, and provides a valuable perspective on the royal mummies described on this website. The other "Special Section" (entitled A Visit to KV 35 on our menu bar) gives an account of Loti's descent into the tomb of Amenhotep II, in which (at that time) the king's mummy and the three Jc mummies still reposed. Loti's two narratives are of great historical interest because they give a vivid impression of the ambience of early twentieth-century Egypt as well as a sense of the impact which an encounter with ancient Egypt had on a person of Loti's era. I've designed the Loti pages to look differently, too. They're more in line with the shadowy, mysterious atmosphere his writing evokes. A third "Special Section" links to my essay on tomb robbing. I try to present the ancient profession of tomb robbing as a practice that grew up within the context of ancient Egyptian religious beliefs rather than as something which departed from them. I hope you will find this essay of interest. And, yes! Due to the increasing use of speedy DSL connections, which make even the most graphics-filled pages download in seconds, I have brought back an Egyptian-themed background image for all the pages! --William Max Miller, M. A. Entry for Ramesses I (?) Completed--The entry for the Niagara Falls Museum mummy now at Emory University has been completed and removed from the "Unidentified Mummies Gallery." It is now located in the "XIX'th Dynasty Gallery" after a consideration of the evidence in favor of identifying it as Ramesses I. Dates for the unofficial discovery of DB320 by the Abd el-Rassul's will be changed throughout the site to reflect the 1860 purchase date of this mummy. Given all the evidence supporting the Ramesses I identification for the Niagara Falls mummy, it appears that the Abd el-Rassul's had found the DB320 cache and had begun exploiting it much earlier than the 1871 date previously given throughout this site. Also, the entry for Ramesses VI has been completed, and work is currently in progress on the entry for Ramesses IX. Mirror Sites Eliminated--There have been a lot of changes on the internet in the year that the TRMP has been online, and not all of them have been good ones. Free web hosting is becoming more difficult to obtain. Many web hosts, in an attempt to make dollars, have severely limited the web space available for free use. Web builders now have to pay for extra space. Hosts have also cluttered up web pages with an endless array of bothersome pop-ups, and web builders now have to pay to eliminate them. Other free web hosts have apparently permanently crashed. For example, the TalkCity version of The Theban Royal Mummy Project--our old main site--has been inaccessible for some time now. Because of growing problems with our mirror sites, the decision was made to eliminate them. We are no longer posting changes to our TalkCity, Angelfire or other mirror sites. Our Tripod site is now the only updated, official version of The Theban Royal Mummy Project available online. We decided to bite the bullet and pay for extra web space. Tripod offered the best deal, and so here we are. The good news is that there are no more pop-up adds on our site! New Links Added--All links to the Theban Mapping Project's website have been updated and now lead to their new, much expanded tomb site pages. The TMP has completely updated their site, and it is now one of the very best sites online devoted to the Valley of the Kings. The new format of this site is absolutely stunning, and it supplies enough information to fill whole volumes. Check it out here. Broken Links Fixed--I've been busy repairing broken links throughout the whole Theban Royal Mummy Project website, and have hopefully tracked down and corrected all of them. Please feel free to report broken links to w.miller115@verizon.net any time you find one. One of the major reasons websites have not attained complete academic acceptability is because they are frequently difficult to use as sources. The primary reason for this difficulty is the fact that so many webmasters suffer from a strange kind of compulsive restlessness that causes them to change the navigation structures and page URL's on their websites! Whenever you link to a page on another website, the assumption is that it will remain accessible. In The News--I just bought the latest issue of KMT (12:2, Summer, 2001), and saw that Egyptologist Ángel González y Arema, who has contributed lots of time, images, and valuable data to the Theban Royal Mummy Project, is mentioned in David Moyer's "For the Record" department. Ángel has been involved with The Egyptian Institute of Islamic Studies' series of courses entitled "Nubia: Land of the Black Pharaohs," for which he presented two lectures: "Burial Customs," and "An Introduction to Meroitic Religion." Congratulations to Ángel for helping to present this important data. Ángel is a dedicated researcher who has an exciting project involving Nubian royal mummies scheduled for the near future. He will be personally examining these mummies and gathering valuable "hands-on" data about Nubian embalming customs. Donald P. Ryan also mentions The Theban Royal Mummy Project in his KMT article, "A Beginner's Guide to Egyptology--2001." Dr. Ryan has us listed in the part of his article where he recommends various websites to students of Egyptology. It is truly an honor to receive this recognition from Dr. Ryan. No Unnecessary Frills--The T. R. M. P.'s experiment with fancy graphics has concluded. They have been removed from our pages because they slowed the downloading times too much. Gone also are the Java class hover buttons from the left-hand menu bar. These also slowed things down too much, plus there were very frequent problems with them. Now we'll use only regular text links, surrounded by shaded boxes. All websites have to compromise between aesthetics and information. Webmasters want to publish pages that look good, but often forget that graphics can get in the way. When viewers write complaining that pages load too slowly, then it's time to change! So the Theban Royal Mummy Project website will have a more austere look from now on, and perhaps this is appropriate to its subject matter. New Graphics--It's easy for me to get caught up in research and forget that websites also need to be visually pleasing. Consequently, I decided to experiment and add a background to the pages. Two new gifs. were also added to the left-hand menu bar. These new graphics derive from the clip-art pages of Neferchichi's Tomb--my nephew Robbie's favorite website. All other graphics (our project logo and all the page headers) are my own creations. Please let me know if the new graphics cause any problems. If I hear that they slow page downloads too significantly, I'll eliminate them. About the Mirror Sites--I also changed the "entrance" page. Instead of a photo of a KV tomb with a "hot-spot" hyperlink leading to the Introduction, you'll now see four hover-buttons, each one leading to a different mirror site. The Theban Royal Mummy Project is published to four different host servers. (Our Special Exhibits are published to a fifth server.) With FrontPage 2000, this kind of duplication is easy, and provides a safeguard against server problems. It seems as though every week, one of these servers has some kind of problem which prevents me from uploading page revisions and other new data. (Yesterday, the images wouldn't download properly on the Tripod mirror site, and I currently can't upload to freeservers.) I wanted to make the mirror site options more visible, hence the entrance page changes. Also, there is now a link to the entrance page on the left-hand menu bar. Please avail yourselves of the mirror sites. If you click on a site and have problems (pages opening too slowly, graphics not downloading, etc.) return to the entrance page and select another mirror site. It is important to give the date because webmasters are always updating and changing things. Since URL's are also changed periodically, I would also recommend that you copy the page onto your hard drive or a disc so that you can supply a hard print copy of the page to your professor along with your paper. I began working on The Theban Royal Mummy Project in Sept., 2000, and phase #1 of the project is almost done. Phase #1 involved completing the entries on all the mummies depicted in the various main Galleries. I still have to complete Gallery I for the 18'th Dynasty, do the entries on Ramesses VI and IX'th, and finish off Unidentified Mummies Gallery I. The mummy of Tutankhamen still awaits completion, also, but I'll probably save this for last due to the enormous amount of published material I'll have to review in order to do a thorough job. I will also include data on the two fetuses found with Tutankhamen in KV 62. Hopefully, this will make the bibliographies easier to read. I also want to add more bibliographical source entries in parenthesis within the body of the text in certain entries. This may not look as aesthetically pleasing, but it will enable viewers to know the exact source for certain key bits of information. Currently, every source I've used to prepare a given entry has been listed in the Source Bibliography at the end of the entry. But this has sometimes made it difficult for certain viewers to determine the exact source for particular statements. Since G. E. Smith, C. N. Reeves, Ikram and Dodson, and other primary sources are used extensively throughout, I feel no need to include more than the Source Bibliography notation on them. However, I often use secondary sources from various Egyptological journals, and believe that it will be more helpful to parenthetically note such sources immediately following any data which I have gathered from them rather than putting them only in the Source Bibliography at the end. What's Ahead--I plan to augment the Source Bibliographies by adding material from sources that I have not yet read. This will, of course, take time, but the bibliographies will slowly grow. Entries themselves will be amended and augmented as I collect new data. The T.R.M.P. will constantly evolve. Viewers who followed the development of the pages devoted to the mummy of Akhenaten?/Smenkhkare? and KV 55's Missing Objects will have noticed that the pages have kept growing and changing over the past several weeks. New data kept pouring in, and revisions became necessary almost daily! KV 55 is a very hot topic right now, and I don't expect daily revisions will be needed for most of the other mummies, but I do plan on trying to make the information in each entry as comprehensive as possible. I would also very much like to include information on mummies from intrusive burials in the Valley of the Kings, but detailed data on them is very hard to find. My ultimate goal is to go to Egypt and personally examine and photograph some of these mummies which have been essentially overlooked in the literature. Undoubtedly, these mummies would provide insight into the practice of intrusive burials, and would supply important data on ancient attitudes toward the Royal Theban Necropolis and its tombs after they were no longer in official use. Egyptological Networking--I've had a lot of fun creating this website, and would like to thank everyone who has provided a link to it on their own websites. I've also been very pleased by the positive reception the site has gotten from professional Egyptologists and researchers. Much thanks to C. N. Reeves, Donald Ryan, and Salima Ikram for their words of encouragement. Thanks are also due to Ángel González y Arema, Dennis Forbes, John Larson, Susan Allen, and Monica J. Verona, who have very generously shared their research with me.